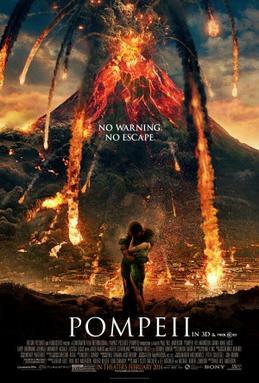 Pompeii is a fairly poor movie that fails to ignite any life into a clichéd script that never knows what story it wants to tell. It’s a fusion of gladiator film, love story and disaster movie with no idea how to balance its different elements and the film is ultimately disappointing. The story of Mt Vesuvius erupting near Pompeii is well known, and could provide scope for dramatic possibilities but ‘Pompeii’ never takes advantage of this until an effects laden conclusion when the inevitable eruption occurs. Titanic, one of the finest entrants in the disaster movie genre, is a success because it crafts a compelling story that makes you forget about the iceberg that will inevitably come. The cast itself is made up with some of my favourite TV actors with Jack Bauer, Mr. Eko and Jon Snow part of the cast, which makes it doubly disappointing that the performances are so bad. Kit Harington isn’t the greatest actor in the world, and he’s fairly wooden here – the film relies on the viewer buying the chemistry between Emily Browning and Kit and it never really materialises. That being said, they’re not helped by the cheesy storyline which expects you to buy them meeting a couple of times over 2 days and falling madly in love. I love Kiefer Sutherland but he’s really really bad here, largely down to a terrible ‘villain’ voice that sounds strange and unnatural. Adewale Akinnuoye-Agbaje and Jared Harris both deliver solid performances but they’re not given much to do. Despite the negatives, I did find some elements to enjoy amongst the poor and the mediocre. The art design for the city of Pompeii is very impressive, and the use of CGI is amongst the best I’ve seen recently. Coupling this with the powerful score generates some really strong moments that the narrative fails to sustain. The scene in the colosseum is well staged and the volcano eruption allows for some fun as the characters try to escape (albeit nowhere near enough lava!). Overall though, this is a pretty poor film, and there are far better films to spend time watching at the cinema at the moment.